Maggie Jones, who played Corrie battle-axe Blanche Hunt, has sadly passed away aged 75. The much-loved actress had been making a slow recovery after falling ill in October, but her condition deteriorated early on Wednesday morning and she died peacefully in her sleep at the Salford Royal Hospital on the 2nd of December. Coronation Street Executive Producer Kieran Roberts said: “Maggie was a much-loved colleague and a wonderful actress who turned Blanche into a true Coronation Street icon. She will be hugely missed by Coronation Street’s many millions of viewers and by everyone who works on Coronation Street". Maggie made her debut on the show in the early 1960s as a policewoman and later returned as a shoplifter. More than a decade later she was back to play Blanche in 1974, but only became a regular cast member in 1999. 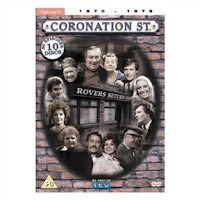 For a selection of Coronation Street classic episodes from the 60s, 70s & 80s visit www.24ace.co.uk. Decade boxsets containing 10dvds start from £49.99.